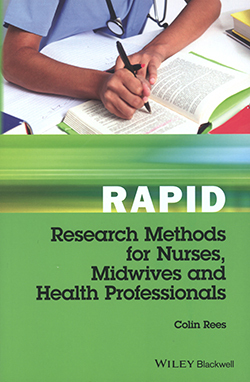 Senior lecturer/programme leader, Deborah Leetham reviews RAPID Research Methods for Nurses, Midwives and Health Professionals. Being able to understand research language is a requisite for the contemporary nurse in the era of evidence-based care provision. The user-friendly text provides extremely accessible information for this purpose. The dictionary-like reference book sets out information in an accessible format that guides the researcher through the main techniques and skills necessary to understand and use research effectively. The book is structured systematically and clearly, allowing the reader to delve in and out of the most relevant pages to suit their needs. The author provides a thorough introduction and explanation of the key words, processes and concepts involved in the research process. The book differs significantly from other available research texts in its alphabetical arrangement of terms and the presentation of research as a practical and useful activity. The author covers aspects of research terminology in sufficient depth to be of value to more knowledgeable and experienced researchers yet makes it accessible for the novice in research writing or clinical activities. Overall, this is an excellent addition to any reference bookshelf and has a great deal to offer all healthcare practitioners. This book will act as a valuable resource for the health professional engaging with research-based activities.